I need to know what’s going on. I need to know what’s happening in my city, what’s popular where family and friends live, and what’s trending in other regions around the globe. After scouring the internet for a solid location-based trending tool, I came upon Trendsmap.com. 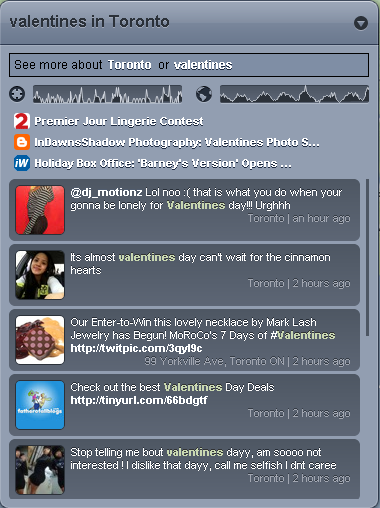 Trendsmap.com is a website that enables you to check out what people are tweeting about in cities around the world. It has an easy-to-navigate map interface that allows you to click-and-drag yourself to all seven continents. Over each twittering city you will see a word cloud with the most popular keywords. Click on a keyword to see who’s saying what about that topic in real-time. You can also click on the cities themselves and see a ranking of the highest trending topics at the time in that particular city. The biggest opportunity Trendsmap.com provides is the ability to instantly crowd-source what’s trending locally with a simple and easy-to-use interface. This is good for tracking local social marketing/engagement initiatives, as well as events with a wide-reach that cross geographic boundaries (Super Bowl, natural disaster, major news story, etc.). 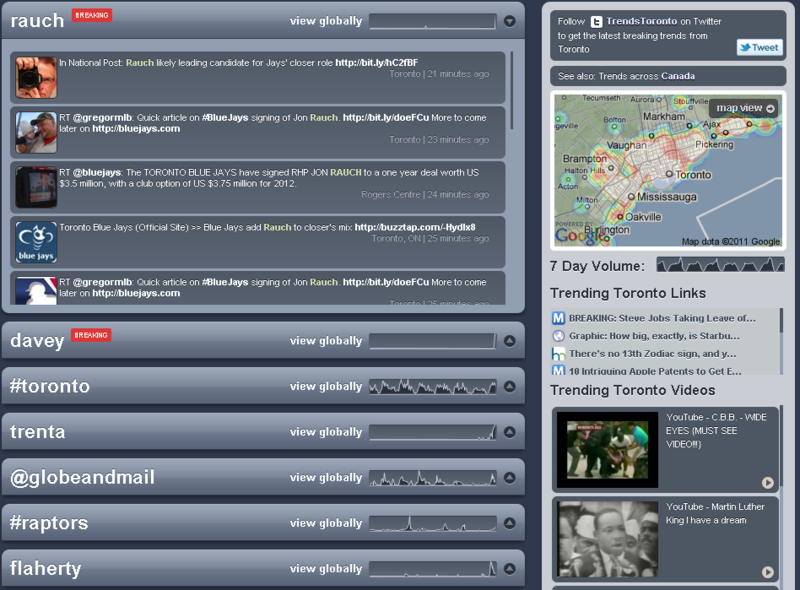 For example, after a minor earthquake struck Ottawa in early 2010, Trendsmap.com was the first place I went for information. I wanted to know what had just happened, who else was affected, and what different experiences were like in other areas. I quickly found that people in Canada were a-Twitter about the quake, with the greatest number of tweets from Montreal, then Ottawa, followed by Toronto. The trend continued to ripple across Canada, making its final appearance in British Columbia. This is the main view. You can navigate to Ottawa, New York City, Los Angeles, Rio de Janeiro, Hokkaido, Paris, London, Moscow, etc. Zoom in for more details, or zoom out to see how similar keywords are trending across regions and countries. From the Map view, you can click on any keyword to get more details on what’s trending (details below). Keyword view gives you a realtime list of tweets containing that word or phrase. Click on the keyword again and you can see who’s talking about that topic across the world. I love this ability. Using this function I found out that #TGIF is largely a North American saying, #MLK is popular in the US mid-January, and complaining about #windchill is almost exclusively Canadian. City view: Once you are in Keyword view, you also have the option of clicking on the city itself. Now you can see a hierarchy of the most popular tweets in your area. Great for a quick comparison of trends by city or region. Below you can see that Toronto is a big sports town, with several of the highest trending topics having to do with their beloved (but often troubled) sports franchises. 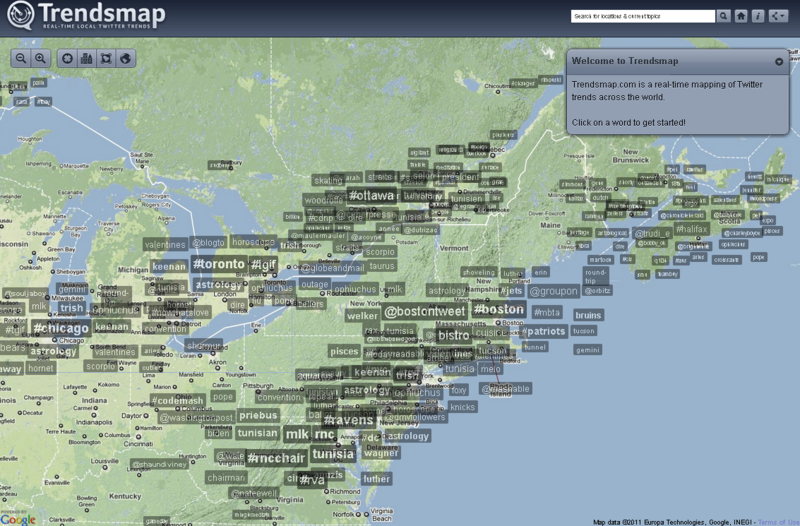 Final thoughts: Trendsmap.com taps into a key strength of social media – listening. Without having to be a part of the conversation, even the most casual user can find utility in this website. Sometimes I use it for entertainment, but often I find myself checking back during business hours to see if our username or hashtags are trending locally; it’s a great way to show your boss the level of conversation you have generated in your market. Looking at the number of unique visitors to Trendsmap.com (between 8K an 20K unique visitors per month in 2010) it seems as though this is a relatively underused tool. We’ll see if their traffic increases as social media becomes increasingly local in 2011. I encourage you to check out Trendsmap.com, give it a test-drive, and be sure to share what you think. Thanks Dave, I really like the Trendsmap site. You’re right, it’s pretty straightforward and utilitarian. I hadn’t seen it before, but I’m always looking for relevant/appropriate hashtags for my tweets (especially when it’s a city-specific event), and this seems like the right place for me to start! I don’t really use Twitter often. However, at my request the site quickly found me someone actively listening to Slayer and I was impressed. Nice layout Bro. Slayer is a great example! Something that specifically interests you found in seconds. Wonderful – I am going to have to try this out. Glad to have connected with you.